Dykstra and partner Mark Van Zwieten advanced from the qualifier in Atlanta in 2007, becoming the youngest team (men or women) to qualify since that information was kept at the start of 2001, with a combined age of just over 39.5 years. As a high school senior Dykstra was a first-team Volleyball Magazine All-American and a member of the Volleyball Fab 50. He was a 2005 all-CIF Division I first team member, and an Under-17 All-American after helping his team win a bronze medal at the Junior Olympics. 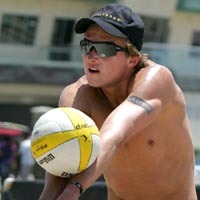 He also finished second in the Junior Beach World Championships Under 19. His older sister, Jenna, played at Davidson College while his father, Joe, played basketball at Western Illinois.